The actual plan was to start early in the morning around 5.30 am so that we can reach Thirupathi by 8.30 am finish breakfast and reach Talakona by 10.am max. Spend an hour at the waterfalls and starting back by 11am and reach back home by 2pm and enjoy the spicy non-veg food at our homes. We were told that Talakona is about 150kms from Chennai which should be 3hours drive. Unfortunate – it being a Sunday, people forgot to change their alarm schedule in their mobiles and those alarms rang at the usual weekday time which resulted in us starting from Chennai at 6am. The first pitstop was at Oothukottai for Tea. Most of the roads once we entered Andhra Pradesh were under construction, had too many deviations and managing the lorry traffic was quite hectic. Was able to reach Thirupathi by 9.30am and had our breakfast. We started the drive again. 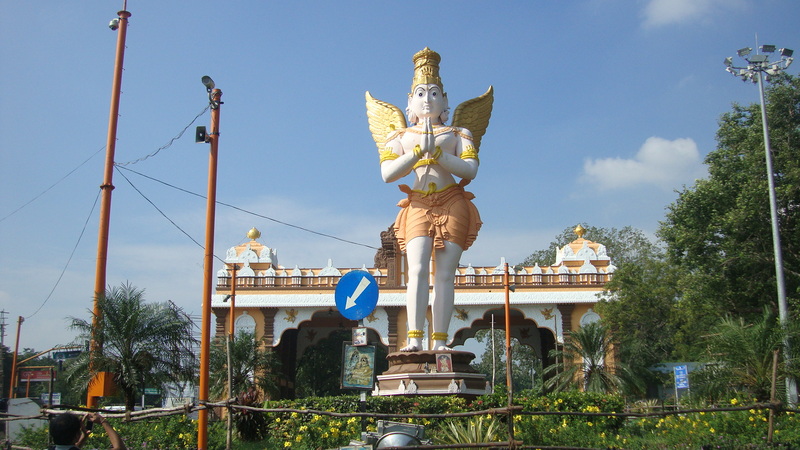 The route to talakona was the same route to Thirumala and to take a left before entering the Ghat session where you will see Lord Garuda welcoming you! 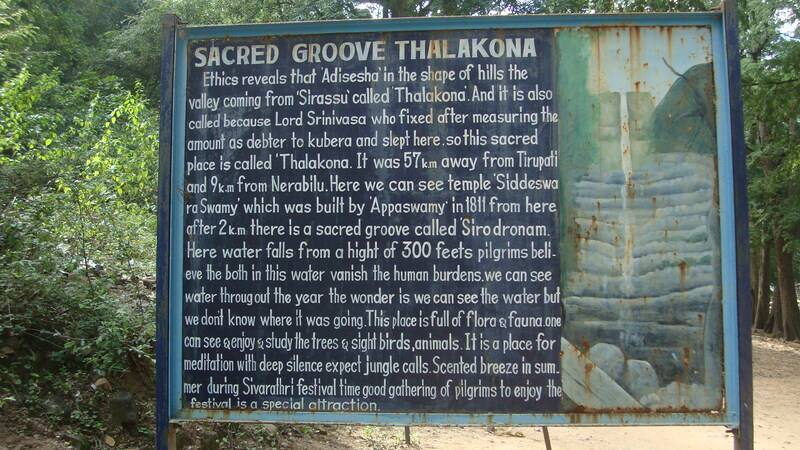 The signboard said its 59kms from Thirupathi. The roads for the first 25 kms was quite smooth as silk and we drove happily. The tough time started after that. It took 2 hours to reach Talakona. 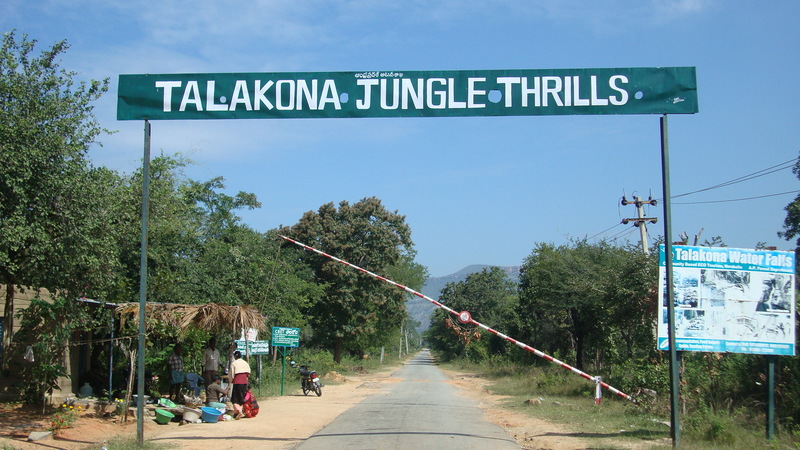 Talakona literally means head hill in Telugu (tala – head and kona – hill) as these mountains are believed to be the starting point of the Tirumala mountain ranges.. 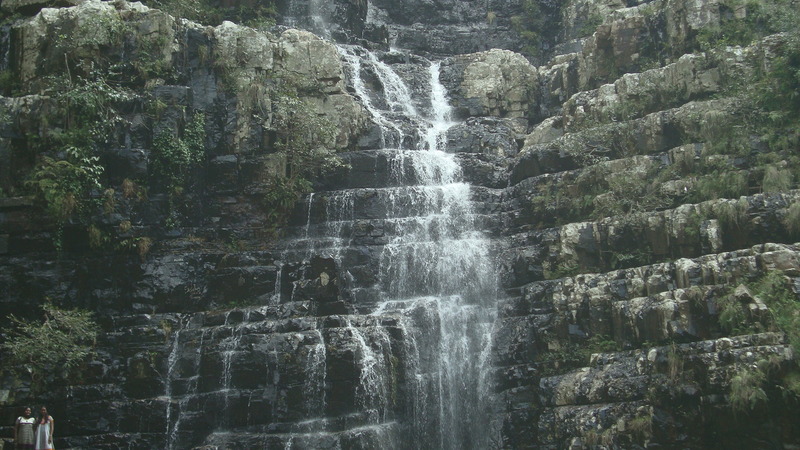 The waterfall is amidst beauty and greenery. The water of Talakona is enriched with herbs and believed to have healing properties as it passes through lot of herbs of medicinal values. A long and treacherous trekking route leads to the top of the hill, which can be reached by multiple paths. Spent a couple of hours in having good bath in the waterfalls and we decided to kickstart the return journey. Reached Thirupathi by 4pm and had our lunch as we couldn’t find any food joints on the way. One will definitely feel to have delicious non-veg after bathing in the waterfalls.. It’s quite difficult to get non-veg food there on the hills which is unfortunate. Started from thirupathi at 4.30 – survived the lorry traffic and head light crashes to reach Chennai back by 8.30pm. Week end was made indeed!